Amber added a laminated Doctor Kit tag, cut the ace bandage in half (way too long for just one) and glued the ends with hot glue or Elmer’s glue so they don’t fray. 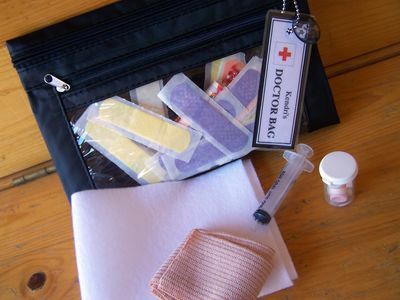 Cut the felt in half, perfect size for a medium to small stuffed animal or doll to lay on for a travel doctor bed, and there were 40 colored band aids in the one box so she split it in half for 20 for each bag. If you don’t have two kids, divide everything and save the extra for replacements! How about a lollipop or two to help them feel “all better?” I’d steer clear of the prescription bottle, especially for young children. Wouldn’t want them thinking mommy’s real pills are candy. Just a quick note about film canisters. They are not to be used for food storage, they can leach chemicals into foods. Also if you plan to use an old prescription bottle, make sure it is cleaned and dry before storing anything else in it. The powder from the medication could get on the candy you are storing in there. I was always told to NEVER store food or medicine in film canisters. The plastic isn’t food grade, and the chemicals from the film can leech into your food. Maybe not a big deal for adults, but maybe dangerous, since this is a project for kids. Adorable!I would loved one of these when I was a little girl playing dolls! try an empty tube of m&ms mini. That’d be about perfect, and its already had food in it!! @brandy, thanks for the great suggestion!